Phone: (304)-269-1569 Office hours are Mon-Fri 9:00 a.m. to 12:00 p.m.
1. We stand for the Bible. It is our law, our creed, and our final authority in all matters relating to faith and practice. 2. We stand for regeneration or "the birth from above" as a basis of church membership. 3. We stand for believer's baptism, the immersion of the believer in obedience to Christ command, as a symbol of the death to the old life and the resurrection to the new. 4. We stand for the separation of Church and State, and for the largest measure of civil and religious liberty. 5. We stand for education, evangelism, and worldwide missionary endeavor. 1. Baptists believe in one God, the Father, the Son, and Holy Spirit-three persons, yet but one God, whose name is Jehovah. 2. Baptists believe in the deity and the humanity of Jesus Christ, who is none other than God the Son manifest in the flesh, and in whom all the fullness of the Godhead dwells forever. 3. Baptists believe that Jesus Christ is the one only Head of the Church; that all believers are equally priests unto God; that ordination, while it recognizes position, bestows no power; that the local church is independent and sovereign. 4. Baptists believe that all men are sinners needing a Saviour; that salvation is only and altogether through simple faith in Jesus Christ, who died for our sins,- faith always accompanied by works meet for repentance, and that without such faith there can be no salvation here or hereafter. 5. Baptists believe in unbroken conscious existence after death determined by life before death' in the personal second coming of Christ to judge the world in the resurrection of the body which for those who die in the Lord shall be like Christ's glorious body; in the eternal weal of the saved and the eternal woe of the lost. There was no Baptist Church in Weston in 1867. 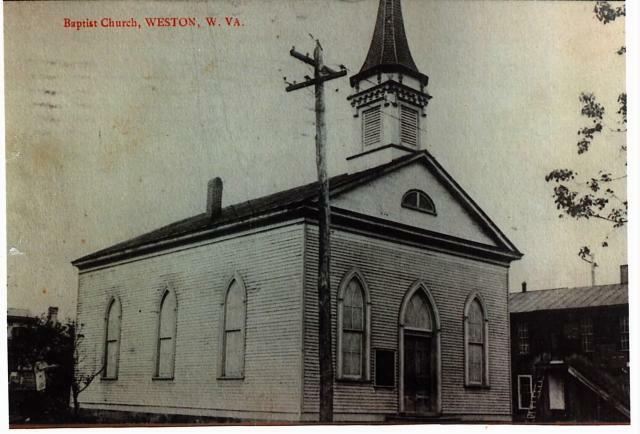 In response to an invitation made by members of Baptist churches living in or near Weston, a council of ministers and members met in the Court House at 10:30 a.m. on September 14, 1867 to consider the possibility of organizing a Baptist Church in Weston. Churches assisting in the organization were: Broad Run, represented by Rev. J. A. J. Lightburn, Murphys Creek by Rev. H. Langford and Mr. James Jarvis who represented the Freemans Creek Church. On October 28, 1867 C. C. Dennison and William A. Depriest were elected deacons, and W. R. Dennison was elected church clerk. In February, 1868 Rev. John Woofter conducted a nine-day revival service; four members were added to the church roll, which already contained fifty-four names. At a meeting on February 23, 1868 a call was extended to Rev. John Woofter; he accepted and became the first pastor of the Weston Baptist Church. It was during this time that the church was received into the Broad Run Association. The pastor received an annual salary of $300; the sexton, John Dawson, was paid $12 per year. Those early years were marked with hardship and struggle. The minister preached in a lodge hail, in the homes of members or in some other church kind enough to loan its building. A committee was appointed in late 1869 for the purpose of securing a lot and arranging preliminaries for building a Baptist Meeting House. The committee consisted of: F. M. Chalfant, W. A. Depriest, C. C. Dennison, J. W. Strickler and Charles Martin. In February, 1871 a three-week protracted meeting was held; it was conducted by Rev. Pat Murray and the pastor. Seventeen members were added to the church roll, fourteen by baptism and three by letter. The committee which had been appointed to visit inactive members reported that they had seen three members and that two of them deserved exclusion. During the early days of the church if a member was not behaving as he should his character was investigated, and if he was found guilty he was asked to withdraw his membership. This practice of exclusion was strictly adhered to during these early years. In spite of numerous obstacles, the church struggled along. 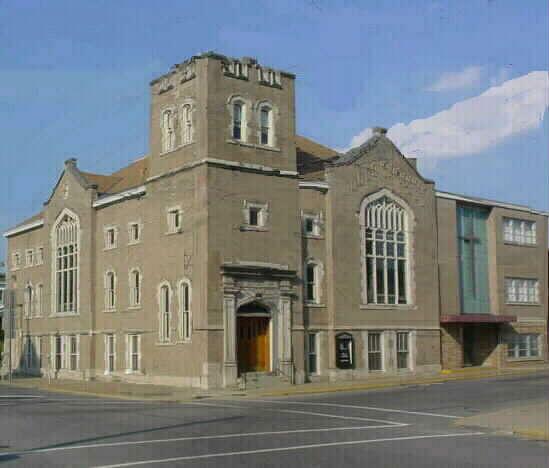 When it was no longer possible to use the M. F. Church South, services were held in the Court House. A committee was appointed to remove the property belonging to the Baptists to a place of safety. The organ and lamps were stored in the Jackson Stables. On August 8, 1874 Rev. J. A. J. Lightburn met with the church and accepted the call as pastor. Rev. Lightburn was a noted General in the Union Army during the Civil War. Rev. Lightburn was employed for half time and paid an annual salary of $30. After the report of the building committee, in November, 1874, it was agreed that a building be erected on the lot donated by F. M. Chalfant. Apparently the committee was not able to carry through with this agreement, because the next reference to a proposed building is not mentioned until August, 1877; at that time the records state that, because of a lack of funds, the room above the Kitson Shop would be used for services. Protracted meetings were held regularly. These meetings aroused a lot of interest and were well attended. During these meetings people enjoyed hearing about the redemp­tive power of the Gospel and sharing the latest neighborhood news. In order to create more interest in the church and make a wider appeal to the young people of the community, a Sabbath School was begun in April, 1880. The first officers were: Mr. Burbach, Superintendent, Hamilton Tallman, Assistant, W. E. Kitson, Librar­ian and J. W. Depriest, Secretary. For some unknown reason, in June, 1895 the membership of the Weston Church took on new life. A request was sent to the Broad Run Association asking that the church membership be restored; this was done. In 1897 the association passed the following resolution: This Association has learned with satisfaction of the desire to build up the church at Weston and it suggests that a collection be taken for the church.4 The collection was taken and by this time the Weston Church had finally established firm roots; from this time on the history is one of steady and continual growth. In the same year, the Weston Church sent a letter to the Broad Run Association stating: By agreement with the Episcipal Church, which agreement was afterwards satisfied by due process of law, the vacant lot held in trust for us was exchanged for the Episcipal Church lot and building thereon. This is a substantial frame building in fairly good repair. By virtue of said agreement we occupy this meeting house one Sunday in each month until the Episcipal Church shall build and have ready for occupancy their new house of worship, which is now in the process of erection and is believed will be completed by the end of the present year. It is devoutly to be wished that the hand of our long-suffering Heavenly Father is leading us in this matter; and we trust that this provision once more of a place in which to worship His name has been of His choosing, and take from us, to some extent at least, the reproach of being unprofitable servants. We invoke your prayers on our behalf and unite with you in a petition to Almighty God to be one in your midst; to counsel and direct you in all your deliberations at your next session.5 This was signed by Thomas Hunter, Church Clerk. Within the year the frame structure was painted and papered. At this time the church paid three-fourths of the pastor's annual salary which was $250, and the State Mission Board paid $120. At a business meeting in January, 1899 the envelope system was adopted. It was agreed that the Lord's Supper would be served every three months, on the Sunday after the first Saturday. In June of that same year the Ladies Aid Society was organized. Mention is made in the church record July 19, 1902 that Miss Lummie Gibson be paid $1 each Sunday for her services as organist. The church responded by undertaking several money-making propositions. In De­cember, 1904 the church sponsored an entertainment at the Opera House. In June 1908 the church accepted the invitation of the Weston Drug Company to take charge of their ice cream department during certain clays of the week; in return the church would receive the profits. In 1905 another organization, the Baptist Young People's Union (B.Y.P.U.) was added to the church. More recently the name has been changed to the American Baptist Youth (A.B.Y.). Many of the early members of this organization have become present-day church leaders. In early 1908 the church voted to become self-supporting. Subsequently, a letter was sent to the State Missionary Board and the American Baptist Home Missionary Society informing them of this move. After six and one-half years of fruitful service, Rev. J. M. Criswell resigned in 1913. In 1914 Rev. E. E. White became pastor of the church. At that time the church had a membership of 140 and the expenditures totaled $2,564.03. One hundred eighty-three were enrolled in Sunday School; the average attendance was 71. The proposition of a new church building was first put before the church December 9, 1914. After discussion by several members, on motion of Roy V Chidester, (father of Virginia Dolan Barnett) the church voted unanimously to proceed to the erection of a new and suitable church building on the old site. A letter from the Ladies Aid Society was read at the meeting indicating that the women meant to do their part in the new enterprise. (Virginia stated her Mother did her share by baking numerous angel food cakes.) 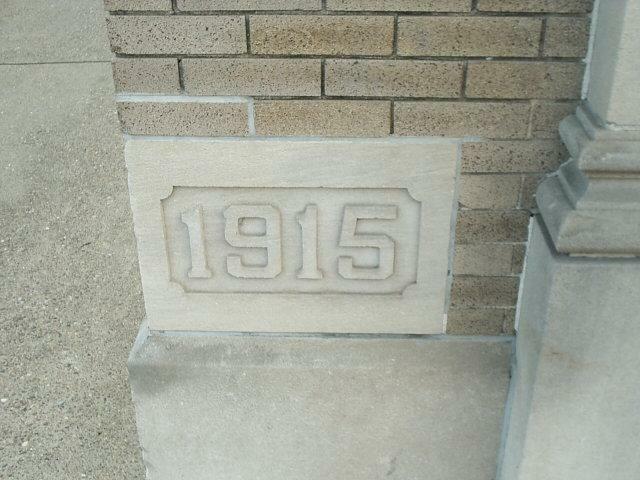 In January, 1915 the architecture of the new building was explained to the church. The question of building a parsonage was indefinitely postponed. On the first of March contractors began work on the construction of the church. This was the first real church the denomination ever owned in Weston. The building was 50x72 feet and 6 inches, two stories high. Columbus gray-speckled brick, laid in white mortar, was used for building purposes. The roof was of green Spanish tile with copper corners. The architectural design is Gothic, with all windows art glass with landscape design of a most attractive appearance. There was one each of the larger ones including the birth, life and crucifixion of Christ, and the other the parable of the sower, elegantly portrayed by the artist. A splendid pipe organ was built in the church as a gift from the Ladies Aid Society. Sunday was a great day for the Baptists of this city and county, and in fact the dedication of the beautiful new house of worship, corner of Second and Center, brought to Weston numerous members and friends of the Church from adjoining counties. Though a little rain was drizzling in the morning, 378 members of the Sunday School assembled at the High School Auditorium. From that room they marched in one solid and inspiring body to enter and possess their new church home. The building was then formally dedicated by Pastor E. F. White, assisted by Dr. Woofter. Then the doors of the church were opened and nine persons presented themselves for membership. The edifice complete and furnished cost in the neighbor­hood of $25,500. In 1921 a parsonage was erected at a cost of $7,383.41. Evidently the parsonage was not used as a home for pastors at that time, because in the minutes of October 8, 1930 mention is made that the Sunday School classes were ordered to vacate the parsonage in order that the pastor might occupy it. In 1953, a house on Court Avenue was purchased for a parsonage to replace the old one adjoining the church. Later the Court Avenue house was sold, and in 1968 a house on Locust Avenue was bought. The church began sponsoring a Boy Scout Troop in 1927. Mr. F. E. Ervin and Mr. Miles Hamilton were active during the early years. We are indebted to others who have helped with scouting during the years the church supported a scout troop. Mr. Hamilton once remarked that scouting was all right until the boys got old enough to notice the girls, then it seemed there were more important things to do than learning to tie knots. In January, 1943 Rev. C. C. Caverlee became pastor of the Weston Church. At that time the church had a budget of $6,000. During 1944, missionary giving amounted to $2,514.50. A special drive was conducted in the winter of 1943 for the relief of the suffering abroad; the church raised $625. After the resignation of Rev. Caverlee in November, 1948 the church called Rev. James Harvey, pastor of the Mannington Baptist Church. During his pastorate several note­worthy projects were completed including: the rebuilding of the pipe organ, new front door, remodeling of the kitchen and a new heating system. Under the leadership of Bill and Sylvia Stevens, two inspiring and successful evangelistic meetings were held. In 1950, Weston experienced a severe flood. No lives were lost but there was consid­erable damage to the church, the basement was covered with several feet of water. Since then the church has suffered property loss during the floods of 1963 and 1985. Each time the trustees, as well as others, have done an excellent job of cleaning up and restoring the church property. After the resignation of Rev. Crouch, Rev. Charles Jack became the pastor (1969-1973). During his pastorate the church records from 1947-1973 were put on micro film. Rev. John Lares became pastor in 1974. While he was pastor a new furnace, a new public address system, a large dishwasher, and a chair lift were purchased. The tower room was once used as a young people's Sunday School Class. One hot Sunday Morning in 1947, Robert Morrissette made a small contribution toward an air conditioning unit. Wetzel Goff, the teacher, encouraged contributions to the fund, and in 1977 the air conditioning was installed. From June of 1991, Rev. John Simmons was our pastor until the late 90's when he was called to the missionary in Thailand. Under his guidance we have reconditioned the organ and the educational unit has received a new roof. Throughout the years the Weston Baptist Church has financially supported many Christian Ministries. The church has regularly made contributions to Alderson-Broad­dus College (this college is related to the West Virginia Baptist Convention). The young people of our church have benefited from their camping experiences at Fisher Camp and Camp Cowen. Parchment Valley, a 1200 acre West Virginia Baptist Conference Center located near Ripley, continues to receive financial support from the church. The Alice Randall Missionary Society, now called American Baptist Women Minis­tries, has been a dedicated supporter of the church's missionary program. Some of the projects the women have supported throughout the years include: Leota Campbell's work with the people in Southern West Virginia, Betty Killian's ministry at the Weirton Christian Center. Each year the women prepare and send out White Cross quotas to home and foreign mission fields. The Ladies Aide, once an active organization in the church, was discontinued several years ago. Scores of members have served the church faithfully in various capacities throughout the years. The church has been spiritually strengthened by having conscientious persons to serve on the Deacons Board. Many have served on the Board of Trustees who have generously given their time and talents to keep the church in good condition. When we look around the church their work can be seen and appreciated. Others have served unselfishly on various boards; and many have silently served the Lord in significant ways. The beautiful stained-glass windows beautifully portray familiar Bible Stories; and the names on the windows indicate the love and devotion these families and Sunday School Classes had for their church. On Wednesday, March 10th 2004, Rev. Jim Crouch, former pastor of our church in the early to late 60s accepted the call to serve as our Interim Pastor until the search for a new pastor was completed. He also served as our Interim Pastor after the resignation of the Rev. John Simmons in the late 90s. On Sunday, September 19th 2004, Rev. Kenneth A. Miller, Senior Pastor from the First Baptist Church of Ravenswood, was voted on to become Senior Pastor of the First Baptist Church of Weston by an overwhelmingly majority. His wife Allison, and his two children Mallory and Nolan also attend our church.16 With Rev. Miller's guidance, we have been able to do many noteworthy projects such as the installation of the new chair lift and the church family also undertook the remodeling of the Pastoral offices. The church is also being equipped with an elevator to provide better access to church floors. Also with Rev. Miller's guidance, we have been able to renovate and remodel our fellowship hall to bring it up to current standards which include increasing the size of the fellowship hall to accomdate 150 persons. We have also been able to complete the restoration of the exterior of the church to prevent further damage from the elements. Rev. Miller is leading our church through many important projects and mininstry of the local area and we are proud to have him serving as our Minister. Pastor Miller also lead our congregation in the hiring of our new Associate Pastor Eric Kendall. Eric is a graduate of West Virginia University and the Master of Divinity program through Palmer Theological Seminary. In his fours years of service, Eric has created several new outreach events like our Fifth Quarter gathering that is held after every home football game of the Lewis County High School. He as also implemented a new vision for the youth ministry and is currently in the process of restructuring the youth minstry know as STRIVE Student Ministries so that we may better serve the youth of our community. Throughout the years the spirit of the Church has been exemplified in its Christian dedication, its unwavering faith in God, and in its sacrificial giving. 1. Minutes, First Baptist Church, Weston, WV, September 1867, 23-24. The Record Books of the Weston First Baptist Church were the primary source of information for this church history. Other sources have been acknowledged in the footnotes. I wish to thank Adelene Spiker for her help in correcting the punctuation and to those who have substantiated certain historical facts.